"Many people believe the age of the life-long, cross-cultural missionary is dead. I wholeheartedly disagree. With the rise of modern technology and short-term trips, this trend has caused some to think the long-term, sold-out, cross-cultural missionary is obsolete and passé. Certainly, it has changed the dynamics of the process (missionaries being able to return home once a year, regularly contact family, etc. ), but it is absolutely not dead and gone. In the contemporary evangelical church, we are encouraged to go (cross-culturally) when we read books like Radical or Let the Nations Be Glad. Hopefully, many pastors and church leaders will encourage you to go. But many people want you to stay. We are called to go where we are not welcome and not to expect or demand a pat on the back (Col. 3:23-24). Cross-cultural missionaries that live in closed countries are not seen by the church. Without improperly glorifying the lifestyle or being self-serving, the cross-cultural missionaries are the “Navy Seals” of the church. They are small in numbers and do some of the most difficult and important work imaginable in the church. And it is all done without much individual publicity. I guess one of the glaring differences, though, is that we aren’t super-Christians. There is nothing fundamentally extraordinary about us. We are just normal people. Many don’t have seminary degrees or extensive theological training. You hear a lot about us but never hear from us. This is due, in part, to security issues. There are no “celebrity” cross-cultural missionaries. You may know a missionary or two from your home church that serves in a closed country. But I bet you a nickel that you can’t name me the author of a book who currently serves full-time in a closed country. Or an active blogger. Or a person whose podcast you listen to. When something big happens, there are books and fanfare, but that is always years after the fact. The overwhelming majority of gospel-centered labor is hard work and grinding. This, however, doesn’t make it any less sweet. When comfort is minimized, joy in the Lord is maximized. You could go so far as to say that cross-cultural missionaries are simply pleasure seekers (somewhere I hear John Piper saying, “Amen!”)." Ehhh John Piper might not say AMEN, but I do!! 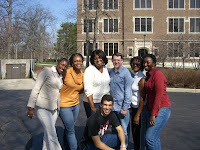 Not that I do cross cultural ministry, well I did in college.